Welcome to “The ARRL Contest Update” from Big Island ARRL News. Views expressed in this contest news summary are those of the reporters and correspondents. Content supplied by HQ ARRL, 225 Main Street, Newington, CT, 06111. Accessed on 03 April 2019, 2155 UTC, Post 921. Following “The ARRL Contest News Letter”, I’ll bring you up to date on a few Hawaii Island Amateur/Ham Radio activities. Here is the current contest information from the ARRL. Please click the above link or scroll down to read the full message. Conversation: Sometimes it’s Not Helpful to be Helpful. U.S. operators licensed for three years or fewer might try the ARRL Rookie Roundup on April 14, 2019. This 6-hour SSB activity complements the CW and RTTY versions that occur in December and August. This event focuses on providing an introduction to competitive contesting. Mentoring of new contesters by those more ‘seasoned’ is encouraged! State QSO parties for Missouri, Mississippi, New Mexico, Georgia, and North Dakota are in the next 2 weeks. QSO parties are a great way to be as serious as you’d like to be in pursuit of a goal, and have fun. Finding an RFI-quiet place to operate from is a challenge with modern electronics all around us. One thing you might do is try portable operations away from homes, businesses, and civilization in general. But where to stay? The USDA Forest Service will rent you a cabin, or even better, a fire lookout tower! By nature, most of these locations are remote, and fire lookouts generally have a height advantage. The one catch is that the “season” for many rentals does not include late fall or winter. Don’t bring RFI problems with you by bringing any RFI-emitting chargers. QRM.GURU is a new website sponsored by RASA, the Radio Amateur Society Australia, that aims to point to resources that can help identify, locate, and reduce the incidence of manmade noise to Amateur Radio operation. The European FT8 Club is sponsoring an FT8 DX Contest on April 13, 2019 1200z through April 14, 2019 1200z. Everyone works everyone in this contest, and the maximum power category for the contest is 100 W. The exchange format is the same as the ARRL RTTY Roundup, with state/province for US/Canada stations, and serial number for DX. The Surrey (British Columbia) Amateur Radio Club’s monthly newsletter “The Communicator” is available. While this month’s focus is on antennas, there’s something for everyone in its 80 well-produced pages. Back issues are the the website, too. Another term for signal splatter, usually caused by too-high microphone gain combined with compression. James, K7KQA, has posted a video of his completed kit construction of a VHF Design power amplifier for 1296 MHz. With 2.5 W able to drive 300 W output, he anticipates mounting it at the dish along with a low noise amplifier (LNA) for EME operation. George, K5TR, opened up his station for a tour and operation by Johnny, W5KV. His visit also coincided with the ARRL International DX Contest. In Johnny’s video of the visit, you get to see the shack, antennas, and listen in on some contest operation. Many familiar stations have posted pictures and comments about last weekend’s CQ WW WPX Contest to Twitter using the #CQWPX and #CQWPXSSB hashtags. Some stations hand-logged the contest! 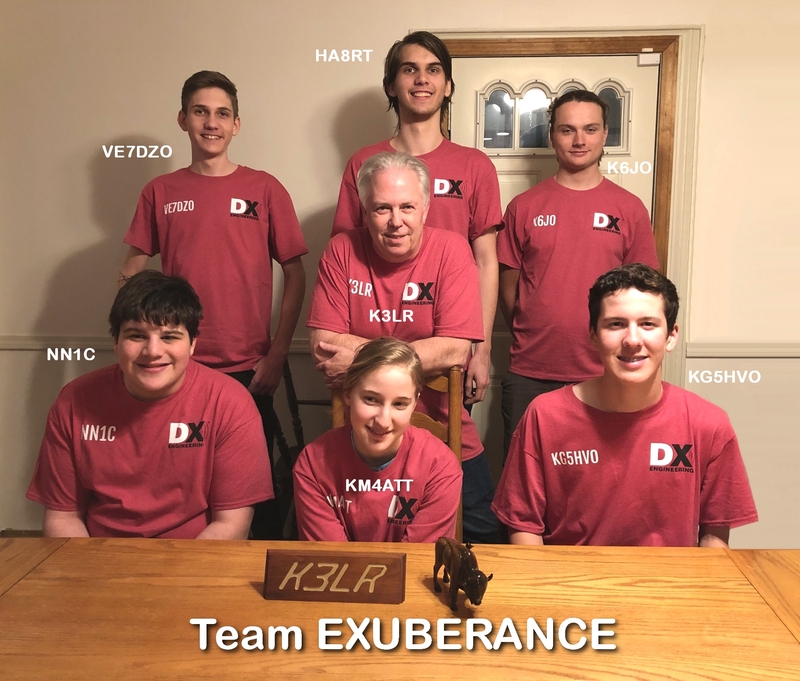 Team Exuberance: Violetta, KM4ATT; Marty, NN1C; Tomi, HA8RT; Bryant, KG5HVO; David, VE7DZO; and Levi, K6JO. They operated K3LR to a potential record for the 3rd call area in the CQ WW WPX Contest. At the time of this writing, Team Exuberance at K3LR is looking very strong in the results for the CQ WPX SSB contest on 3830scores.com. According to Tim, K3LR: “Looks like a new 3rd call area all-time record for Team Exuberance in the CQ WPX phone contest!” They are reporting 23,796,192 points, with 6008 contacts. The team included Violetta, KM4ATT; Marty, NN1C; Tomi, HA8RT; Bryant, KG5HVO; David, VE7DZO; and Levi, K6JO. 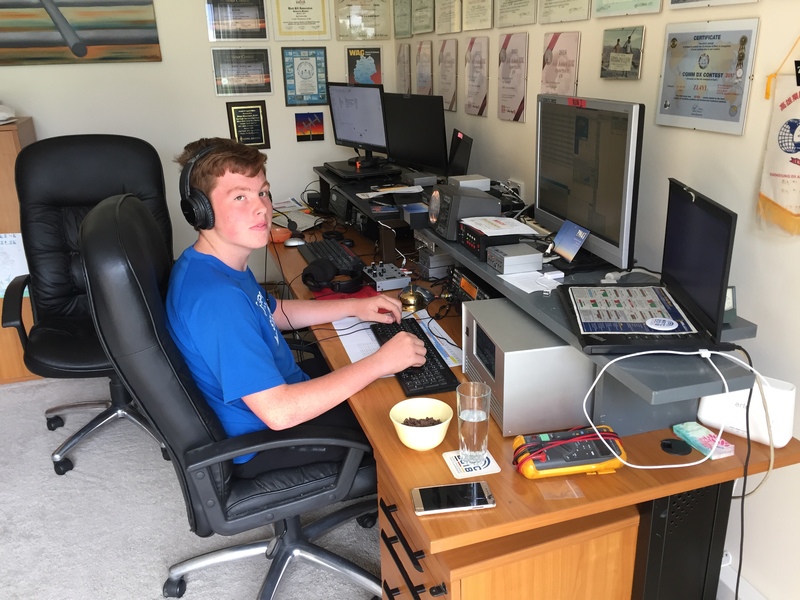 There were a number of other youth-oriented operations for the CQ WW WPX Contest, including ZM4T, which was all young people, and at 9A7P, 14-year-old Jakov was the operator. On the Sunday of the contest, there were many stations searching and pouncing that were NOT in the Super Check Partial database, indicating that there were many casual operators participating in the contest. That’s great news, too! If you’re using an amplifier and compression, a good practice is to monitor your transmitted signal for splatter, hum, distortion, and other undesirable characteristics using spectral monitoring tools. 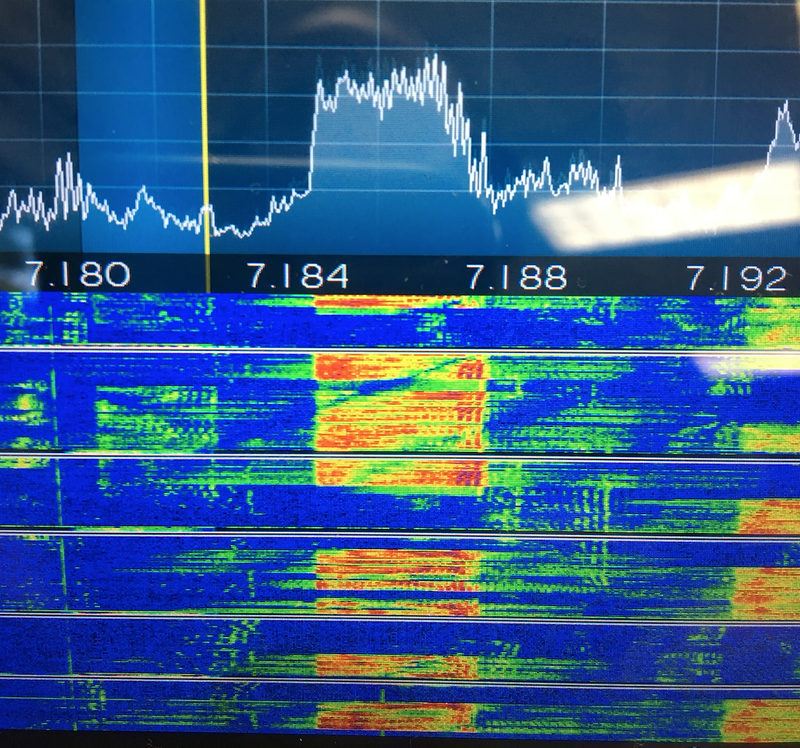 Since many modern radios ship with these capabilities built in, you could probably ask another operator with these tools to take a picture of your signal with their phone and send it to you. A splatter-infused 8-kHz-wide signal caused by gratuitous compression might earn some elbow room in crowded band conditions during a contest, but the cost might be a DQ from the contest sponsor for “unsportsmanlike conduct.” Make sure you understand what you’re seeing, and that the methods used reflects transmission characteristics, and not artifacts of the receiving setup. Most smartphones can capture a reasonable picture from spectrum display. Don’t just ask for a description of how your signal sounds on the air, also ask for a picture of your signal! The signal 7.188 MHz looks like it’s up to 8 kHz wide. Lance W7GJ, reports via the Pacific Northwest VHF Reflector that the VHF/UHF comparison tables by Lionel, VE7BQH were updated on March 26, 2019, and are available on his website. The tables cover antennas for 6 meters through 70 cm. The “week counter field” in GPS messages turns over on April 6. This may, or may not affect applications that depend on this data field in the GPS stream, depending on how the application was written. This rollover event has occurred before in 1999, but since that time there’s been a proliferation of inexpensive GPS chips embedded in all sorts of devices. Tower and roof-mounted equipment presents its own set of challenges for environment protection, temperature control, and power. Enclosures and gear that work for Wireless Internet Service Providers (WISPs) would also work for Amateur Radio purposes. While operating in the CQ WW WPX Contest last weekend conditions made it difficult to copy the exchange of some stations. This sometimes required asking for multiple repeats to tease the serial number out of the ether between QSB and QRM. It’s part of the game, the reason why this contest uses a non-prefillable datum for the exchange. Multiple repeats are time consuming and can be frustrating for the stations involved in the QSO. For any other stations waiting for a contact and listening to both sides, it also must be frustrating, especially if they can hear both sides clearly. A couple of times during the contest, one of the listening/waiting stations would “help” me or the other side by conveying the exchange information. This is not OK. Do not do this. In the one instance that I recall most vividly, I’d finally copied the exchange in the clear, at a QSB peak, when there wasn’t QRM, and was about to confirm to the sender when the exchange information also came in loud and clear from someone else on the frequency. I did not feel a sense of relief – quite the opposite. I was disappointed. Since I’d worked so hard on getting that exchange, my efforts were instantly diminished by that two-digit utterance by someone who was impatient and didn’t want to wait. I don’t know which of my subsequent callers actually provided that bit of information. In reading the rules, I don’t see that this practice is specifically forbidden, but I would classify it under “unsportsmanlike conduct.” Is this a situation to be remedied? Is there even a remedy to this situation? Throw out the QSO, which punishes the wrong parties? Or like so many other aspects of contesting, do we trust the integrity of the operators involved in the actual QSO to interpret whether the QSO should be logged as valid? An expanded, downloadable version of QST’s Contest Corral is available as a PDF. Check the sponsors’ website for information on operating time restrictions and other instructions. CWops Mini-CWT Test, Apr 3, 1300z to Apr 3, 1400z and, Apr 3, 1900z to Apr 3, 2000z and, Apr 4, 0300z to Apr 4, 0400z; CW; Bands: 160, 80, 40, 20, 15, 10m; Member: Name + Member No., non-Member: Name + (state/province/country); Logs due: April 6. NRAU 10m Activity Contest, Apr 4, 1700z to Apr 4, 1800z (CW) and, Apr 4, 1800z to Apr 4, 1900z (SSB) and, Apr 4, 1900z to Apr 4, 2000z (FM) and, Apr 4, 2000z to Apr 4, 2100z (Dig); CW, SSB, FM, Digital; Bands: 10m Only; RS(T) + 6-character grid square; Logs due: April 18. SARL 80m QSO Party, Apr 4, 1700z to Apr 4, 2000z; SSB; Bands: 80m Only; RS + Serial No. + Grid Locator or QTH; Logs due: April 11. SKCC Sprint Europe, Apr 4, 1900z to Apr 4, 2100z; CW; Bands: 160, 80, 40, 20, 15, 10m; RST + (state/province/country) + Name + (SKCC No./power); Logs due: April 11. QRP Fox Hunt, Apr 5, 0100z to Apr 5, 0230z; CW; Bands: 80m Only; RST + (state/province/country) + name + power output; Logs due: April 11. NCCC RTTY Sprint, Apr 5, 0145z to Apr 5, 0215z; RTTY; Bands: (see rules); Serial No. + Name + QTH; Logs due: April 7. NCCC Sprint, Apr 5, 0230z to Apr 5, 0300z; CW; Bands: (see rules); Serial No. + Name + QTH; Logs due: April 7. LZ Open 40m Sprint Contest, Apr 6, 0400z to Apr 6, 0800z; CW; Bands: 40m Only; 3-Digit Serial No. + 3-Digit Serial No. received from last QSO; Logs due: April 16. PODXS 070 Club PSK 31 Flavors Contest, Apr 6, 1000z to Apr 7, 0400z; BPSK31, QPSK31, BPSK63, QPSK63, BPSK125, QPSK125; Bands: 20m Only; 070 members: (state/province/country) + member no., Non-members: (state/province/country) + name; Logs due: April 14. Missouri QSO Party, Apr 6, 1400z to Apr 7, 0400z and, Apr 7, 1400z to Apr 7, 2000z; CW, Phone, Digital; Bands: 160, 80, 40, 20, 15, 10, VHF/UHF; MO: RS(T) + county, non-MO W/VE: RS(T) + (state/province/territory), DX: RS(T) + “DX”; Logs due: May 7. Florida State Parks on the Air, Apr 6, 1400z to Apr 6, 2200z and, Apr 7, 1400z to Apr 7, 2200z; CW, SSB, Digital; Bands: 80, 40, 20, 15, 10m; FL Park: park ID), non-FL Park: (state/province), DX: RS(T) + “DX”; Logs due: April 21. Mississippi QSO Party, Apr 6, 1400z to Apr 7, 0200z; CW, SSB, Digital; Bands: 80, 40, 20, 15, 10, VHF/UHF; MS: RS(T) + county, non-MS: RS(T) + (state/province/country); Logs due: April 30. SP DX Contest, Apr 6, 1500z to Apr 7, 1500z; CW, SSB; Bands: 160, 80, 40, 20, 15, 10m; SP: RS(T) + 1-character province, non-SP: RS(T) + Serial No. ; Logs due: April 30. EA RTTY Contest, Apr 6, 1600z to Apr 7, 1600z; RTTY; Bands: 80, 40, 20, 15, 10m; EA: RSQ + province, non-EA: RSQ + Serial No. ; Logs due: April 22. RSGB RoLo SSB, Apr 7, 1900z to Apr 7, 2030z; SSB; Bands: 80m Only; RS + previous 6-character grid square received; Logs due: April 8. NAQCC CW Sprint, Apr 10, 0030z to Apr 10, 0230z; CW; Bands: 80, 40, 20m; RST + (state/province/country) + (NAQCC No./power); Logs due: April 13. Phone Fray, Apr 10, 0230z to Apr 10, 0300z; SSB; Bands: 160, 80, 40, 20, 15m; NA: Name + (state/province/country), non-NA: Name; Logs due: April 12. CWops Mini-CWT Test, Apr 10, 1300z to Apr 10, 1400z and, Apr 10, 1900z to Apr 10, 2000z and, Apr 11, 0300z to Apr 11, 0400z; CW; Bands: 160, 80, 40, 20, 15, 10m; Member: Name + Member No., non-Member: Name + (state/province/country); Logs due: April 13. RSGB 80m Club Championship, SSB, Apr 10, 1900z to Apr 10, 2030z; SSB; Bands: 80m Only; RS + Serial No. ; Logs due: April 11. NCCC RTTY Sprint, Apr 12, 0145z to Apr 12, 0215z; RTTY; Bands: (see rules); Serial No. + Name + QTH; Logs due: April 14. NCCC Sprint, Apr 12, 0230z to Apr 12, 0300z; CW; Bands: (see rules); Serial No. + Name + QTH; Logs due: April 14. QRP ARCI Spring QSO Party, Apr 13, 0000z to Apr 13, 2359z; CW; Bands: 160, 80, 40, 20, 15, 10m; RS + (state/province/country) + (ARCI number/power); Logs due: April 27. JIDX CW Contest, Apr 13, 0700z to Apr 14, 1300z; CW; Bands: 160, 80, 40, 20, 15, 10m; JA: RST + Prefecture No., non-JA: RST + CQ Zone No. ; Logs due: May 14. F9AA Cup, PSK, Apr 14, 1200z to Apr 15, 1200z; PSK; Bands: 80, 40, 20, 15, 10, 2m; RST + Serial No. ; Logs due: May 14. FT8 DX Contest, Apr 13, 1200z to Apr 14, 1200z; FT8; Bands: 80, 40, 20, 15, 10m; W: RST + state, VE: RST + province/territory, non-W/VE: RST + Serial No. ; Logs due: April 28. OK/OM DX Contest, SSB, Apr 13, 1200z to Apr 14, 1200z; SSB; Bands: 160, 80, 40, 20, 15, 10m; OK/OM: RS + 3-letter county code, non-OK/OM: RS + Serial No. ; Logs due: April 21. SKCC Weekend Sprintathon, Apr 13, 1200z to Apr 15, 0000z; CW; Bands: 160, 80, 40, 20, 15, 10, 6m; RST + (state/province/country) + Name + (SKCC No./”NONE”); Logs due: April 21. Texas State Parks on the Air, Apr 13, 1400z to Apr 14, 0200z and, Apr 14, 1400z to Apr 14, 2000z; All; Bands: All, except WARC; TX Park: RS(T) + park abbreviation), W/VE: RS(T) + (state/province), DX: RS(T) + “DX”; Logs due: May 31. New Mexico QSO Party, Apr 13, 1400z to Apr 14, 0200z; CW, Phone, Digital; Bands: 160, 80, 40, 20, 15, 10, 6m; NM: Name + county, non-NM: Name + (state/province/country); Logs due: April 27. North Dakota QSO Party, Apr 13, 1800z to Apr 14, 1800z; CW, Phone, Digital; Bands: 160, 80, 40, 20, 15, 10, 6, 2m; ND: RS(T) + County, non-ND: RS(T) + (state/province/country); Logs due: May 14. Georgia QSO Party, Apr 13, 1800z to Apr 14, 0359z and, Apr 14, 1400z to Apr 14, 2359z; CW/Digital, Phone; Bands: 160, 80, 40, 20, 15, 10, 6m; GA: RST + county, non-GA: RST + (state/province/”DX”); Logs due: April 28. Yuri Gagarin International DX Contest, Apr 13, 2100z to Apr 14, 2100z; CW; Bands: 160, 80, 40, 20, 15, 10, Satellites; RST + ITU Zone No. ; Logs due: May 8. WAB 3.5/7/14 MHz Data Modes, Apr 14, 1000z to Apr 14, 1200z (FT8) and, Apr 14, 1200z to Apr 14, 1400z (RTTY) and, Apr 14, 1400z to Apr 14, 1600z (PSK) and, Apr 14, 1600z to Apr 14, 1800z (FT8) and, Apr 14, 1800z to Apr 14, 2000z (RTTY) and, Apr 14, 2000z to Apr 14, 2200z (PSK); RTTY, PSK31; Bands: 80, 40, 20m; British Isles: RS + serial no. + WAB square, Other: RS + serial no. + country; Logs due: May 5.
International Vintage Contest HF, Apr 14, 1200z to Apr 14, 1800z; CW, SSB, AM; Bands: 80, 40, 20m; RS(T) + 4-character grid square; Logs due: April 24. Hungarian Straight Key Contest, Apr 14, 1500z to Apr 14, 1600z; CW; Bands: 80m Only; RST + Serial No. + Power Code; Logs due: April 29. ARRL Rookie Roundup, SSB, Apr 14, 1800z to Apr 14, 2359z; SSB; Bands: 80, 40, 20, 15, 10, 6m; Name + 2-digit year first licensed + (state/province/XE area/DX); Logs due: April 17. 4 States QRP Group Second Sunday Sprint, Apr 15, 0000z to Apr 15, 0200z; CW, SSB; Bands: 160, 80, 40, 20, 15, 10m; Member: RS(T) + (State/Province/Country) + Member No., Non-member: RS(T) + (State/Province/Country) + Power; Logs due: April 17. Phone Fray, Apr 17, 0230z to Apr 17, 0300z; SSB; Bands: 160, 80, 40, 20, 15m; NA: Name + (state/province/country), non-NA: Name; Logs due: April 19. SARL VHF/UHF Digital Contest, Apr 6, 1000z to Apr 7, 1000z; Digital; Bands: 50 MHz, 70 MHz, 144 MHz, 432 MHz, 1296 MHz; RST + 6-character grid locator; Logs due: April 29. 144 MHz Spring Sprint, Apr 8, 1900z to Apr 8, 2300z; (not specified); Bands: 2m Only; 4-character grid square; Logs due: April 22. 222 MHz Spring Sprint, Apr 16, 1900z to Apr 16, 2300z; (not specified); Bands: 222 Mhz; 4-character grid square; Logs due: April 30. Also, see Missouri QSO Party, Mississippi QSO Party, F9AA Cup, SKCC Weekend Sprintathon, Texas States Parks on the Air, New Mexico QSO Party, North Dakota QSO Party, Georgia QSO Party, ARRL Rookie Roundup, above. ARRL membership includes QST, Amateur Radio’s most popular and informative journal, delivered to your mailbox each month. Subscribe to NCJ – the National Contest Journal. Published bimonthly, features articles by top contesters, letters, hints, statistics, scores, NA Sprint and QSO Parties. Subscribe to QEX – A Forum for Communications Experimenters. Published bimonthly, features technical articles, construction projects, columns and other items of interest to radio amateurs and communications professionals. Free of charge to ARRL members: Subscribe to The ARRL Letter (weekly digest of news and information), the ARES E-Letter (monthly public service and emergency communications news), Division and Section news — and much more! ARRL Contest Update wishes to acknowledge information from WA7BNM’s Contest Calendar and SM3CER’s Contest Calendar. According to Kevin Bogan (AH6QO), a test of the VOAD Mauna Kea repeater (146.72 MHz-PL100.0) will happen on Saturday, 06 April 2019, from 1200-1300 HST. All Hawaii radio amateurs are urged to check in. Doug Wilson (KH6DQ) is continuing his free Technician License classes on Hawaii Island. The six-week classes include five training sessions, with licensing exams given on the final week. Here are the upcoming class dates: 6:30 p.m., 19 April 2019, Discovery Harbor in Ka’u; on 23 May 2019 in Waimea (location to be announced); and on 17 October 2019 at the Keaau Community Center. The classes are free, with the normal $15.00 testing fee to the ARRL. Current licenses wanting to upgrade may take exams for the General and Amateur Extra Class at the same time. For more information, please contact Doug at douscelle@aol.com. Registration is now being taken for the new ARRL EMCOMM EC-001 course. According to ARRL Pacific Section Manager Joseph Speroni (AH0A), “The new EC-001 course addresses Hawaii’s situation as an island state. Students will be assigned mentors in Hawaii who are knowledgeable in relationships with our local served agencies.” To register, please send an email to Clem Jung (KH7HO at kh7ho@arrl.net. For the latest Amateur/Ham Radio news and information, please check the blog sidebars and links. Thes news feeds are updated daily and weekly. You can find current ARRL press releases on the right hand sidebar of this blog. Thanks for joining us today.